All content © 2014 ORIVeDA • All rights reserved. Nothing is allowed to be reproduced without permission. If you’ve ever visited an anti-quackery website, you might have noticed that one of the standards they use to define a ‘snake oil’ product is that it claims to help for a lot, if not all health problems. Our immune system, if we could bottle and sell it, would definitely be classified as ‘quackery’ using that standard, and it would probably never receive a FDA stamp of approval. It lacks a so-called ‘single identifiable active ingredient’ which can define the ‘mechanism of action‘. Since the main action of e.g. medicinal mushrooms is balancing the immune function and, by doing so, restoring health and quality of life, they are very suspect in the eyes of the anti-quacks. Too good to be true = snake oil = quackery. Although these anti-quacks are often right, they are wrong this time. Let’s see how the immune system operates. We share the planet with countless pathogens, such as bacteria and viruses. The immune system is the human body’s defence against these ‘foreign invaders’. Consisting of a complex network of cells, tissues, and organs, the immune system involves a sensitive process of checks and balances within the body that produce an immune response that is prompt, accurate, effective and self-limiting. As a result, scientists believe that a healthy immune system can be compared both in scope and complexity to the workings of our brain and nervous system – and it is every bit as important for survival. How does the body’s immune system function? What are the main factors that influence its ability to fight infection and disease? Here’s a layman’s explanation. The ability of the immune system to protect the body is based on an incredibly elaborate and dynamic regulatory-communications network. A complex network of cells, tissues and organs stationed throughout the body passes information back and forth, like clouds of bees swarming around a hive. This includes the lymphoid organs because they are concerned with the growth, development, and deployment of lymphocytes – the white cells in the blood that are the key operatives of the immune system. Lymphocytes come in several varieties — we’ll explain those below. Apart from the blood and the lymphatic vessels that carry lymphocytes to and from the other structures in the body, lymphoid organs include the bone marrow, thalamus, lymph nodes, spleen, tonsils, adenoids and the appendix. There are about 600 lymph nodes (or glands) most of them clustered around the neck, groin, and armpits. As lymph flows through the body, it filters the body of disease. During an examination, doctors often feel the lymph nodes in the neck to see if they are swollen. Swollen lymph nodes mean that the nodes are producing additional white blood cells because the body is fighting an infection. Cells destined to become immune cells are, like all other blood cells, produced in the bone marrow, the soft tissue in the hollow shafts of long bones. 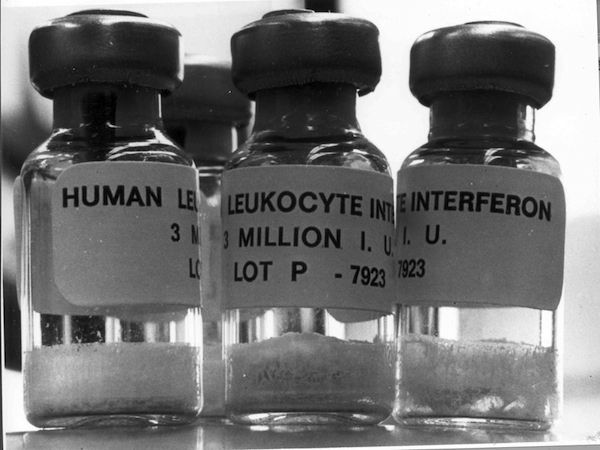 Here, they develop into two major types of lymphocytes called B cells and T cells. While B cells complete their maturation in the bone marrow, T cells migrate to the thymus, an organ that lies high behind the breastbone, where they multiply and mature into cells capable of producing an immune response. Once they have matured, some lymphocytes congregate in immune organs or lymph nodes while others use the blood circulation as well as a body-wide network of lymphatic vessels to travel widely and continuously throughout the body. Another type of white blood cells called macrophages (which can be translated as ‘big eaters’) reinforces the work of the lymphocytes because they engulf and digest micro-organisms and antigens. Along with white blood cells, the immune system employs a complex system of small, bean-shaped lymph nodes in the neck, armpits, abdomen, and groin to create lymphatic routes for the body. 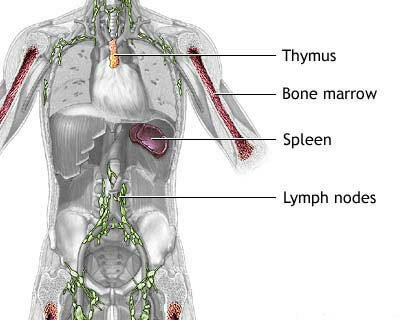 Each lymph node contains specialised compartments that house platoons of B cells, T cells, and other cells capable of sparking an immune response. Clusters of lymphoid tissue can be found in many parts of the body, such as around the mucous membranes lining the respiratory and digestive tracts that serve as gateways into the body. They include the tonsils and adenoids and the appendix. Further, the immune system deploys the spleen, a fist-sized organ at the upper left of the abdomen, as a filter for the blood. In the spleen, B cells become activated and produce large amounts of antibodies. Also, old red blood cells are destroyed in the spleen. The immune system has many different types of cells acting together to take care of unwanted infections and altered cells. Cytokines are the chemicals produced by these cells in order to communicate and orchestrate the attack. Binding to specific receptors on target cells, cytokines recruit many other cells and substances to the field of action. Cytokines also encourage cell growth, promote cell activation, direct cellular traffic, and destroy target cells. 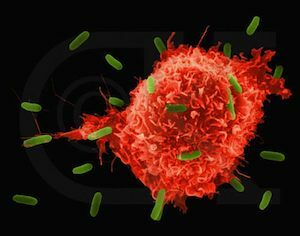 Cytokines include interleukins and growth factors, but another cytokine – interferon – is considered especially important because it can boost the immune system’s ability to recognise foreign invaders. In humans, there are three major classes of interferon: alpha, beta and gamma. Because interferon is considered an effective anti-viral agent, and is important both for orchestrating and stimulating the immune system response, it is used to treat Hepatitis C and other diseases. Moreover, researchers have shown that pharmaceutical interferon, given in daily doses, can prevent infection and illness. However, pharmaceutical forms of interferon can cause side effects such as nosebleeds and are not considered useful in treating established colds. While researching medicinal mushrooms, it became evident that some of them are immune-regulators, substances that can quiet or activate the immune system, depending on the particular circumstances. An immune-regulator quiets an overactive immune system, and it increases activity when the immune system is sluggish. Basically, an immune-regulator triggers the production of white blood cells when the system is under-active, and it lowers their number when the system is overactive (allergies, various auto-immune diseases, etc.). Cordyceps sinensis e.g. was found to stimulate the production of interferon. More about the specific effects of medicinal mushrooms in a later article.. The immune system is considered one of the most sophisticated systems in the human body because it displays several remarkable characteristics. The central duty of the immune system is to distinguish between what belongs to the body – ‘self’ – and what doesn’t belong to the body – ‘non-self’- . For this reason, every cell that originates in the body has distinctive molecules – identification papers, so to speak – that mark it as ‘self’. But when the immune system encounters an antigen – the substance that announces the cell or organism is ‘non-self’ – the immune troops move quickly to eliminate the intruders. What happens is that the presence of the antigen signals interferon or another cytokine to trigger an immune response by either the B or T cells. When the foreign microbe presents an antigen on the surface of one of these cells, the B or T cells multiply and produce antibodies that specifically bind to that antigen. Psoriasis is an auto-immune disease. This trigger response then leads to other parts of the immune system engulfing and killing the invading cells or to what is known as the ‘complement destruction cascade’, where serum proteins called ‘complement’ bind to the immobilised antibodies and destroy the bacteria by creating holes in them. 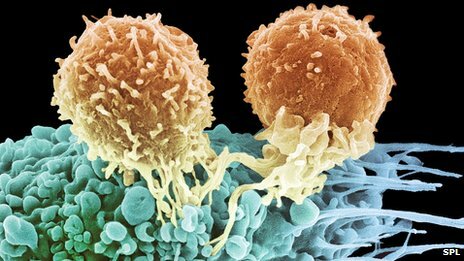 Whenever T cells and B cells are activated, some turn into ‘memory-cells’ that enable the immune system to remember previous experiences and react accordingly. Thus, if a person were to contract chicken pox, the immune system would produce memory cells for this disease, resulting in future immunity. Long-term or ‘specific’ immunity can be naturally acquired by previous infection or artificially acquired by vaccines made from infectious agents. 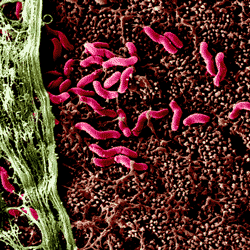 Problems in the immune system come in two varieties. When the immune system is under-active, it makes you susceptible to infections, cancer, and other illnesses. When it is overactive, it may create allergies and autoimmune reactions. Auto-immune means the immune system is overstimulated and mistakenly attacks the body. Diseases such as diabetes, lupus, psoriasis and lymphoma are autoimmune diseases. AIDS, hepatitis, the flu, and colds, on the other hand, are associated with a weakened, under-active immune system. A foetus already has an immune response and once born, he or she has a fully intact natural immune response. That system is stimulated after birth (more ‘acquired’ immunity) and reaches its peak at the onset of puberty, between ages 11 and 15 (sometimes later, if a child lives in a hygienic environment). When we age our immune function starts to decline. Many old age related diseases are related to this. A well-functioning immune system is essential for a good quality of life. Then, starting at age 35 or so, the immune system starts making mistakes. Some parts are active while others are lazy, and some parts may overdo it and perhaps cause autoimmune disorders. 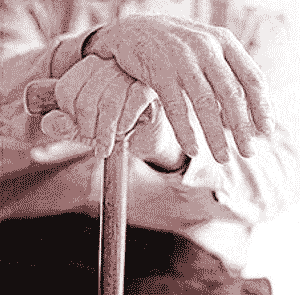 After age 50 a steady decline sets in, leading to all kinds of old-age diseases. While the elderly produce the same number of lymphocytes as their younger counterparts, their configuration is different leading to less vigorous and less effective infection-fighting cells. To be blunt, the human body is not supposed to live long past that age. Nature wants you to make room for subsequent generations after your fiftieth birthday. At the same time, research points to psychological stress, lack of adequate sleep, poor diet and lack of exercise as factors that affect the immune system. Because stress produces many different effects on the endocrine systems, including the well-known fight or flight response, scientists hypothesise that the abilities of the immune system are diminished after frequent activation of the autonomic nervous system in the case of chronic stresses. For example, a large study comparing the parents of children with cancer with parents whose children were relatively healthy showed that chronic psychological stress might reduce the immune system’s reactions to hormonal secretions that were normally used to fight the inflammatory response. Regarding the link between sleep and the immune system, research summarised by the National Sleep Foundation finds that sleep deprivation weakens the immune system, increasing susceptibility to colds and the flu (both caused by a virus). It is also not uncommon for people who suffer from sleep deprivation to suffer from other problems including diabetes, asthma or a second sleep disorder. Another example is the ulcer. Many people believe ulcers are directly caused by stress. This is not true; ulcers are caused by the Heliobacter Pylori, a nasty bacteria (identified for the first time in 1982) that lives in our stomach, but is not causing problems in 80% of those infected with it. But if we are under stress of whatever nature, this stress might affect our immune system. Which can make a ‘harmless’ bacteria turn into a potentially life-threatening one (stomach cancer might also be caused by the Heliobacter Pylori). Another example of the importance of a well-functioning immune system. The role of nutrition in determining the strength of the immune system has also been widely studied. According to a number of studies, both undernourished people and those who are overweight or obese are at greater risk from infections. At the same time, research suggests that reducing the amount of fat in the diet may increase immune activity. For these reasons, nutritionists recommend a well-balanced diet that includes plenty of fruit, vegetables, low-fat dairy products and whole grains. In one placebo-controlled study of healthy elderly adults, daily consumption of a multivitamin- multi-mineral supplement already resulted in fewer days of infection-related illnesses. © oriveda.com 2014 – all rights reserved. Visit our website for more background and our products.